Chhatra Sagar, located in Pali, is simply the right destination for those who are seeking perfect getaway. 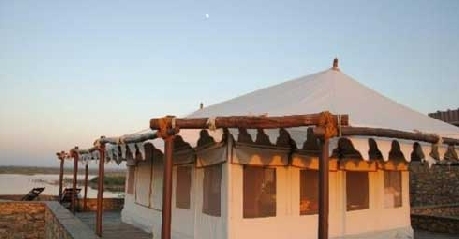 The ideal location of these tents lets travellers have some of the best moments here. Those of you who want to make the most of your stay can choose to stay here. Beautifully designed tents when coupled with items of comfort and luxury redefine holidaying experience. It is the right blend of enchanting views, lush green environment and open spaces that let you have memorable moments. What further add to your staying experience is the personalised services and soothing environment that makes you feel home away from home. Chhatra Sagar lets you relax and unwind in a way like never before. The entire ambiance captures the essence of romance. Let this vacation be yours an experience that you will cherish for many years to come. Come and unwind in a royal Rajasthani style. 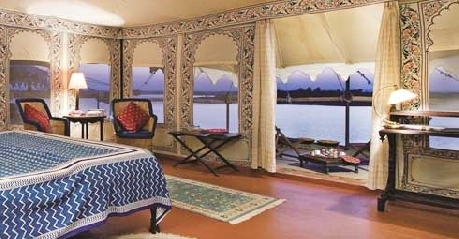 Luxury tents that you will get here for accommodation lets you make the most of your visit. 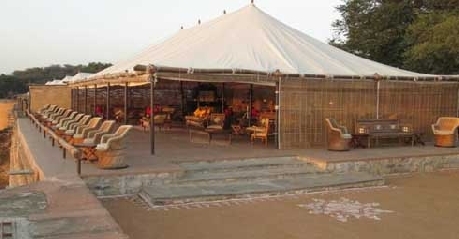 Tents have always been an integral part of Rajput lifestyle. Camping here is an experience that will you cherish for many years to come. There are eleven guest tents located on the dam and two tents on hill offering complete privacy to the travellers. All tents here are east facing so that you can enjoy sunrise in the early morning. Each tent overlooks the lake offering wonderful and soothing views. In addition, there is a private sitting space that lets travellers enjoy moments of solitude. 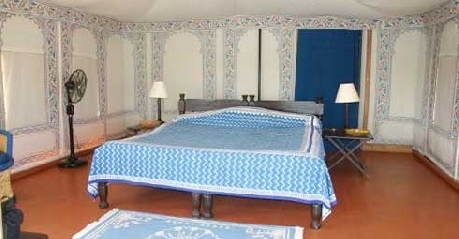 Each tent is hand stitched with great care and interiors are done with block printing in conventional floral motifs. Highly spacious, well-furnished and comfortable tents when coupled with stylish furniture enhance the overall decor of the tents. 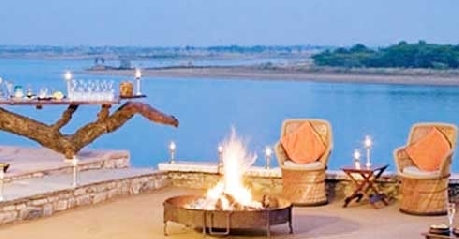 When it comes to dining at Chhatra Sagar then you can be assured to have a never before culinary experience. 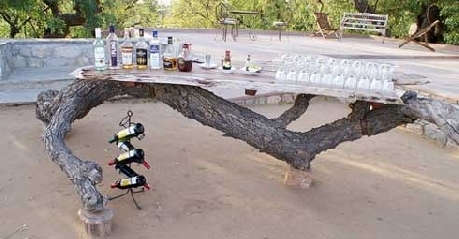 No matter whether you prefer enjoying meal under the canopy of stars or in room dining, food served is second to none. The entire range of menu comprises of traditional recipes allowing you to taste delicious Rajasthani food. All the dishes are prepared using fresh farm ingredients so that guests can dig into some of the scrumptious dishes. There is nothing that can be compared to digging into authentic dishes that chefs prepare exclusively for the guests. Give your culinary experience a new meaning here.